Here is my finished rainbow heart quilt for Orlando Pulse survivors/families. The Orlando Modern Quilt Guild is collecting these, and there is still time if you want to send one. The butterflies are the HSTs that were trimmed from the lower corners of the heart blocks, and then I framed them to bring them up to size. The back is a light green dragonfly print, and it has a row of print rectangles inserted in it. 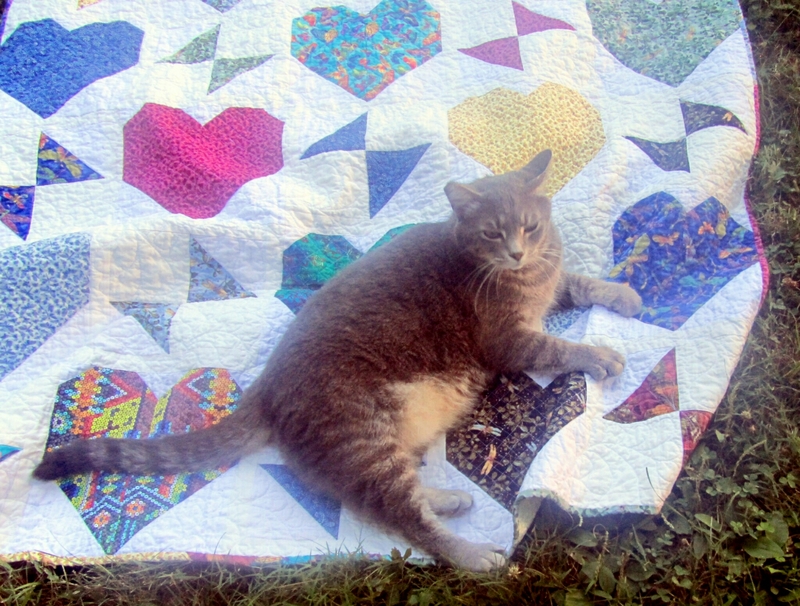 I quilted half-inch and one-inch grids inside the hearts, and free-form feathers in all the white space in between. And, of course, I had this snuggle-tested, and it passed! Categories: Finishes | Tags: Evening in the Garden, heart, Orlando, Pulse, Rainbow, Valerie Root | Permalink. The quilt is gorgeous and the quilting is awesome! Ooh this came out so pretty!! !